In the past, I've written about the Carroll Gardens Newsstand's former life as Helen's Candy Store. 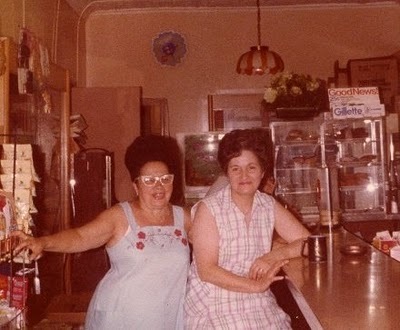 As Helen's, the tiny Smith Street storefront was a beloved local institution, known for its superlative egg creams. It was run by two sisters who lived upstairs, Helen Hanaway, who had a reddish-blonde beehive hairdo, and Georgia. Working the counter were the two women seen below. The one on the right is Josie. The woman on the left is Lilly, who was cross-eyed, and whom no one ever forgot once laying eyes on her. Lately, the owners of the newsstand have been making some ill-advised "improvements." They've scraped the front clean of all its posters and stickers. And they've revamped the interior. So now it's cheap-looking in a junky new way, rather than cheap-looking in a charming, grimy way. But, there's a silver lining. They haven't finished the ceiling. So in one corner, you can see what must have been the tin ceiling that Helen's Candy Shop once sported. If only I could convince to tear out all those acoustical tiles and refurbish the tin ceiling!